Senator Leila M. De Lima is one of the staunchest voices in the Philippine human rights and justice fronts. Having the privilege of working with the country’s top politicians and legal luminaries, Senator De Lima is bringing her 29 years of experience, legal expertise and integrity in the difficult challenge of crafting laws in her first term in the 17th Congress. Appointed as Chairperson of the Commission on Human Rights (2008 – 2010), De Lima has energized the country’s premier human rights body in addressing cases of human rights violations as she led a team of young lawyers and human rights activists in investigating extrajudicial killings, enforced disappearances, and all forms of human rights violations throughout the country. As Secretary of the Department of Justice (2010 – 2015), De Lima carried out the President’s directives in resolving renowned cases, including the prosecution of several prominent figures linked in the misuse of development funds, the murder of media practitioners in Mindanao, and the dangerous raids of the prison cells for maximum security inmates, subsequently exposing and ending their luxurious lifestyle. It was also under her watch as head of the Inter-Agency Council Against Trafficking that the Philippines was removed from the US Human Trafficking Watchlist, paving the way for its long-hoped-for upgrade to Tier 1 status. 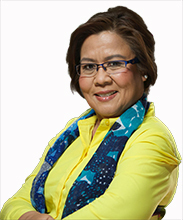 De Lima has gained honors from the public and private sectors, bestowing her numerous awards and citations, including the prestigious MetroBank Foundation Professorial Chair for Public Service and Governance in 2010 and the Excellent Public Servant Award, Defender of People’s Rights, and “Agent of Change” Award in 2010, among many others. Prior to her appointment to government posts, she has spent much of her career in private practice. She also worked as a law clerk and secretary for the House of Representatives Electoral Tribunal (1993 – 1995), legal staff for Supreme Court Associate Justice Isagani A. Cruz (1986 – 1989), partner for various prestigious law firms (1989 – 2008), and law professor in Election Law, Business Organizations, Persons and Family Relations, Transportation Law, Statutory Construction (1986 – 1994; 2006 – 2007). Like her father, Senator De Lima also made strides as one of the most prominent election lawyers in the country, handling high-profile cases of electoral fraud for national and local candidates. Elected as 12th senator in 2016, De Lima now sets her eyes on shepherding meaningful policy and structural reforms into laws intended to improve the country’s criminal justice system, promote human rights, strengthen the rule of law, fighting graft and corruption, and introducing changes in the Constitution and election laws. Born in Iriga City, Camarines Sur on the 27th of August 1959, De Lima was educated in Catholic institutions where she always graduated top of her class. In 1985, she placed 8th in the Bar Examination, bringing pride to her alma mater, San Beda College, where she earned her law degree and was later on conferred with the Most Outstanding Alumna awards in 2010 and 2011. The eldest daughter of the late Election Commissioner Vicente B. De Lima and Norma E. Magistrado has two sons, Israel and Vincent Joshua, and two loving grandchildren, Brandon and Hannah.